Wood River sophomore Haley Cutler hammers a ball, watched closely by teammates Brittney Bradley (left) and Madi Hendrix (right). Everybody contributed for the Wood River High School varsity volleyball team Tuesday in its 25-19, 25-15, 25-19 home Great Basin Conference triumph over the Burley Bobcats on the Hailey hardwoods. Wood River (14-11 overall, 5-3 league) clinched the No. 3 seed in the Oct. 15-16 league tournament with a 34-kill attack led by senior co-captains Kori Paradis (14 kills, 2 blocks, 6 winning serves) and Lily Richards (14 kills, 6 winning serves with 2 aces). It was a dominant Wolverine victory, coach Tim Richards’ winning squad notching 34 kills to Burley’s 22, and the Hailey girls piling up 34 winning serves to Burley’s 13. The outcome made it likely that Wood River will play the No. 6 seed, either Burley or Canyon Ridge, in the first round of the GBC double elimination tournament on the Twin Falls High School court Monday, Oct. 15. The winner of that match would next play the No. 2 seed, probably Jerome. In Tuesday’s first game, sophomore setter Brittney Bradley (8 winning serves, 1 ace, 23 assists) stepped to the stripe with her team leading 14-13 and served three straight winners. The Wolverines didn’t look back. Paradis ended the game with 5 kills, Richards 4. Soph libero Ciceley Peavey (17 digs) added 5 winning serves and soph Haley Cutler had 2 winners. Wood River polished off both the first and second games with winning blocks at the net, junior Sydney Thomsen (2 kills, 1 block) providing the block in the first game and junior Mary Petzke (2 blocks) in the second. Richards pounded 6 kills in the lopsided second game victory. Senior Madi Hendrix (3 kills) chipped in with 3 winning serves at mid-game. Burley’s defense picked up its intensity in the third game and threatened to cut into Wood River’s early 13-3 lead. Yet every time the Wolverines needed a point, Paradis and Richards provided them with 6 and 4 kills respectively in the finale. Paradis also had 5 straight winning serves, and Petzke made an unbelievable dig giving Hailey a 19-11 lead. Pacing Burley (2-9, 1-6) were senior Brooke Bowers (6 kills), senior Allison Hepworth (5 kills, 2 blocks), junior AnnGee Wayment (4 kills, 2 blocks) and senior libero Ciera Page (4 winning serves). 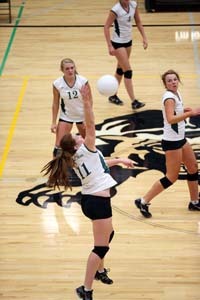 Last Thursday, second-place Jerome (21-8, 6-1 league) won at home 25-12, 25-21, 25-55 over the slow-starting Wolverines. Top players in the 29-kill Hailey offense were Paradis (12 kills out of 45 swings) and Lily Richards (10 kills out of 32 swings). Adding kills were Petzke (2) and Cutler (3). Wood River competes today, Friday and Saturday, Oct. 6 in the 19-team Maverick Invitaional tournament in Boise and Meridian. The Wolverines play their pool-play matches against Minico of Rupert and Borah today from 4-8 p.m. at Borah High School. Based on today’s results, the Hailey girls will advance into either the Gold or Silver divisions for Saturday’s double elimination tourneys. Wood River wraps up its regular-season slate Tuesday, Oct. 9 at league-leading Twin Falls (27-15, 7-0) and Thursday, Oct. 11 with “Senior Night” against Canyon Ridge. Sparked by the hitting of McKayla Mecham, the Carey Panthers volleyball team swept the Richfield Tigers in three games for a Northside Conference victory last Thursday. Lilly Rivera played well with digs on defense and Paige Koudelka led the Carey serving, coach Kathy Whitworth said about the key league win. The win started a busy stretch of four matches in seven days for Carey (8-8 overall, 6-6 league). Carey lost on the road Monday to Camas County in Fairfield 25-16, 25-15, 25-22, then won the first game but dropped Tuesday’s league match at Dietrich 19-25, 25-13, 25-20, 25-17. Wednesday, Carey evened its league mark with a three-game home sweep over the Community School Cutthroats (0-12, 0-10 league). Next week’s matches will firm up the seedings for the eight-school Northside tourney starting Oct. 16.